Machu Picchu is Peru’s most popular destination, and brings wealth to tour operators and shopkeepers along the tourist route, but some are missing out. Machu Picchu is Peru’s most popular tourist destination, attracting around one million visitors each year, including thousands of Australians. It brings wealth to tour operators and shopkeepers in the popular tourist towns between Cusco city and at the famous ruins. But only a short distance away Peruvians are still living in poverty. As Brianna Piazza reports, many are yet to experience the benefits of one of the country’s most profitable industries. Tourists have been coming to Peru’s Sacred Valley for years. Located close to 2500 metres above sea level and surrounded by stunning scenery, Machu Picchu is Peru’s most visited tourist attraction. Most visitors stop at the towns of Urubamba and Ollantaytambo as they make their way towards Machu Picchu. In those towns the constant flow of international visitors has given many locals a much-needed income from selling souvenirs and food. However, only a short distance from the Sacred Valley’s main tourist route, there are poor villages that are yet to significantly benefit from tourism. Near Ollantaytambo is the small village of Chaullacocha. Most familes live in traditional mud-brick houses, growing potatoes and herding alpacas on small plots. The villagers here are too far from the well-worn tourist route to profit from the enormous visitor numbers. And they are keen to get their share. Some women have begun selling their traditional alpaca weavings through a not-for-profit group set up to help them. President of Chaullacocha’s Women’s Weaving Association, Lucia Castillo Yupanqi says the weavers are starting to tailor their work to tourists’ tastes – but it is a labour intensive job. The not-for-profit group, Threads of Peru, sells the weavings online, aiming to provide them with a fair and regular income. 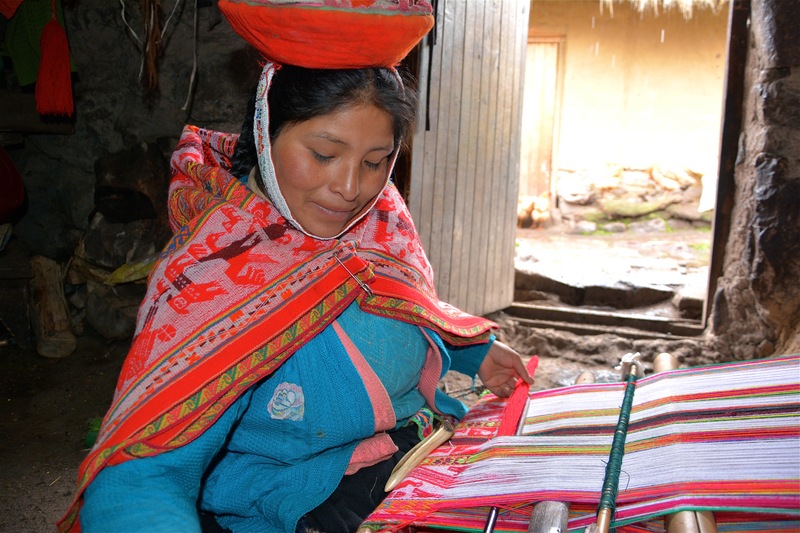 The organisation also teaches ancient weaving techniques to other Peruvian women. Urbano Huayna has been leading treks to Chaullacocha for around five years. Nearby Rumira is closer to the Sacred Valley’s main tourist route. Rumira is accessible by road from Ollantaytambo and some houses have electricity. But local woman Mercedes Quispe Medina says very few tourists make it as far as her village. She is hopeful of making more money online. Threads of Peru’s project coordinator, Dana Blair says more than half of the money from online sales goes directly to the weavers. She says the rest covers administrative costs and training. However, she says it’s difficult to convince tourists and wholesalers to pay fair prices for the products they sell – which are often more expensive than their mass-produced equivalents. For a few weeks each year, Chaullacocha’s men leave their farms to work as porters on the famous Inca Trail. Antonio Rios Churata has been a porter for 15 years. Over a four-day trek he typically earns around 60 or 70 Australian dollars. It’s a wage he says is extremely important for his family. But he believes porters should be paid more, as it’s a physically-demanding job. Dana Blair says tour companies take advantage of porters, who are mostly poor, in order to keep prices low for tourists. She says many foreigners don’t realise this is one of the most negative aspects of Peruvian tourism. Ariana Svenson is the co-founder of a company that organises treks to less visited parts of the Andes, where life has changed little since the time of the Incas. She says there is a lot more to see in the region than Machu Picchu. Her company offers homestays, where foreigners can stay with families in remote villages. She says despite the dramatic landscapes and unique local culture, few foreigners visit. But for now, many Andean families can only hope that one day tourism will provide them with a regular income and a better life.